Happy Tuesday, JNSPers! Today, I want to share a DELICIOUS breakfast shake recipe with you. 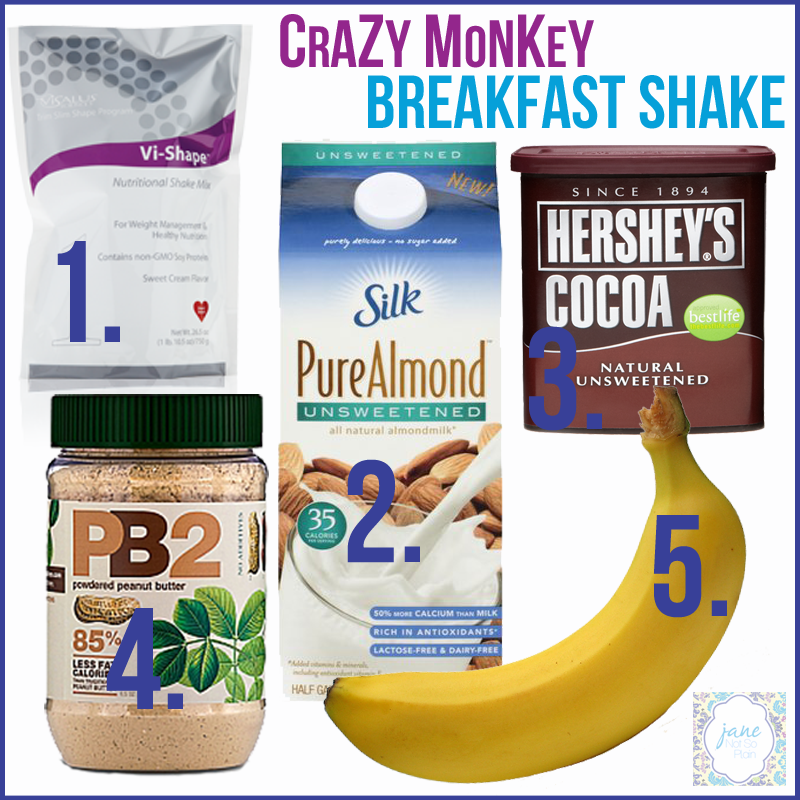 The Crazy Monkey Breakfast Shake is only 5 ingredients and 265 calories of yumminess! Nutritional Information taken from MyFitnessPal. Let me tell you, this shake tastes SO GOOD that you don't even realize that it's such a healthy option for breakfast. 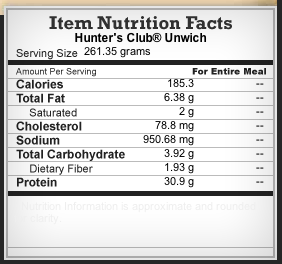 It has a great amount of protein, so it's super filling! Try it out and let me know what you think! Unfortunately, I did not make Rams Cheerleaders. And, honestly, I am pretty bummed about, though I am trying to remind myself that everything happens for a reason. It's always difficult when you work really hard for something and it doesn't work out as hoped. It was a great experience, and I am so proud of myself for giving it a shot. I am not sure why I didn't make it, but I think I am going to email the squad director for feedback. I told myself that this would be the last year that I tried out, but I am not sure anymore. We'll see what the future holds and what the feedback looks like from the director. I worked really hard, eating really well and working out a ton. At my last check-in (not a weigh-in because I didn't weigh, I got pinched), I was at about 21.5% body fat, which was down 5% from the month before. Since November, I have lost about 15lbs. All I have to say is that I feel great! And, let me tell you, it is a wonderful feeling not having any pants in my closet fit because they are too big! I am giving myself the rest of this week to relax, rest, and decompress. I will start back at it working out regularly and eating as clean as possible on Monday. I have been pinning clean eating tips and recipes like crazy here and here if you want to try them out too! Have a good weekend and be kind to one another! 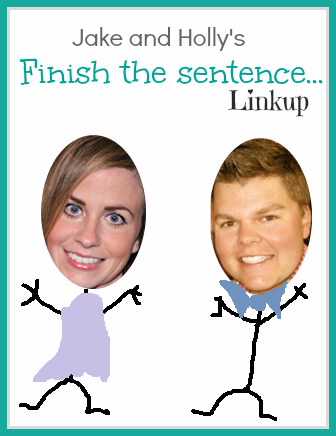 Here we go for round three of Holly & Jake's Finish This Sentence link party! 1. I laughed so hard I cried when...is it weird that I have never cried from laughing? Don't get me wrong, I have laughed really hard before, usually when I am with my BFFs, but have never cried from laughing. 2. My high school... still holds a special place in my heart. I was poms captain, DECA president, StuCo VP, and in honors classes. I was the definition of an over-achiever, but I loved every minute of it. 3. 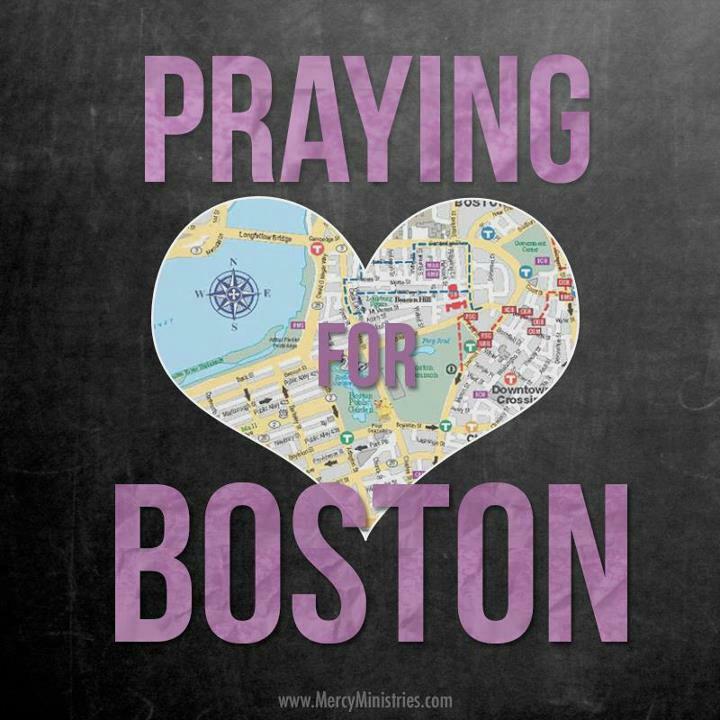 It really pisses me off...when people do senseless stuff, like bombing the Boston Marathon or go on shooting sprees in elementary schools. 4. In ten years...I want to be self-employed. My long-term plan is two-fold: first, I want to be a full-time blogger with an Etsy shop; second, I want to open a sewing lounge that is like a paint-your-own-pottery place, but sewing! 5. If I could erase one thing...I would erase my second semester of my sophomore year of college. I like to refer to that period as my "dark days" and would rather that time just disappear all together. 6. In 1999...I was 11 and in 5th grade. I had glasses, braces and a weird haircut. HELLO AWKWARD! 7. Honestly...I want to punch people in the face that don't believe in equality. We were all created equal and deserve the same rights and treatment, regardless of race, religion, or sexual orientation. 8. To me, Sushi...is the bomb dot com! I love everything from Nigiri to fried rolls. YUM! 9. Someone really needs to invent...a way for me to clone myself. I need one of me for school and work and another one of me for creating, cooking, and working out. 10. The first time I drank alcohol...was the weekend before high school graduation. I was with my sister and her husband and it was a ton of fun! I drank Peche Lambic (among other things), and I have loved Lambics ever since. 11. The one question I would ask God is...why does there have to be so much hate in people's hearts? 12. Lindsay Lohan...is a hot freakin' mess! I loved her in Freaky Friday and Parent Trap, but somewhere along the line, she lost her mind and her dignity! Well, today is the day that I have prepping for for about 5 months now. My nails are done, my swimsuit rhinestoned, and everything packed up ready to go. I have done the dance countless times in my head and gone over potential questions, but my mind keeps wandering back to what happened yesterday in Boston. It makes me angry, and it makes me sad that someone would have so much hate in their heart to do something like this. All I have to say about it is try to be a little kinder, offer an encouraging word, and try to bring light into the dark place our world can be at times. It's the least we can do to honor the victims of the senseless act that occurred yesterday. I love eating out! Don't get me wrong, I like eating in too, but it's just so easy to grab something on the go when I am out and about running errands. Lately, I have been really good about cooking my food ahead of time and bringing my food for the day with me to work and school. Yesterday, though, I was running errands and didn't bring my next snack/meal with me. Poor planning on my part, but Jimmy John's saved the day! My love for JJ started in college, and it hasn't wavered one bit since. They have great sandwiches with fresh ingredients, so what's not to love? Well, if you are watching what you eat, then their homemade French bread may not be the ideal choice. Don't worry though, Jimmy John's has 2 healthier options: swap the French bread for 7-grain wheat (my favorite wheat bread around, not gonna lie) or turn your sandwich into an Unwich with a lettuce wrap instead of bread. It was a low carb, high protein meal for under 200 calories, so it fit perfectly into my meal plan for the day. AND, it was super delicious too! I have not been compensated by Jimmy John's for this post. I am simply sharing what I know and love!